Not getting out often enough can stress a bird out. You can't accuse a parakeet of hiding his feelings when he's stressed. A stressed bird will squawk, scream, fidget and otherwise let you know that he needs some calm—all you have to do to give it to him is figure out why he's bothered and address the issue. Remove anything from the environment that might bother your bird. For example, the presence of a cat or dog can really freak out your parakeet, so consider blockading his room to keep other animals out. Similarly, keep his cage away from any open windows, as even something as simple as a car's headlights can spook him. Say hey when you get a chance. 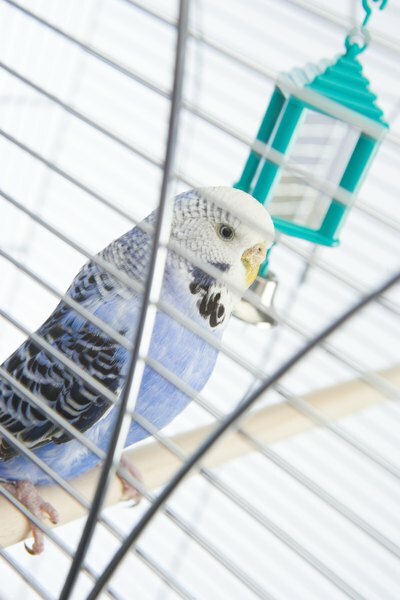 If you walk by your bird's cage and ignore him, he might develop a bit of a complex—seriously. When you happen to go by his tiny wire home, acknowledge him. Let him out and play with your feathery buddy. Parakeets can't stay in the cage all the time, and if you don't take him out for some personal interaction every day, it's going to put a strain on his nerves. Stock his cage with toys and other means of entertainment. You wouldn't want to be locked in an empty room with nothing to do, and your bird feels the same way. He needs toys and perches to keep him occupied, and you should switch them out every few days so he doesn't get sick of them. Make sure that his cage is roomy enough. A parakeet's cage should be at least 24 inches wide, 8 inches tall and 36 inches high—and that's the minimum. Imagine having to live in a closet: that would be stressful for anyone. Don't resort to shutting your bird up with treats. That's a temporary solution to a long-term problem, and if you do it, you'll only teach him that acting out gets him a reward. What Causes Parrots to Feel Stressed? Why Will My Parakeet Not Stop Chirping?